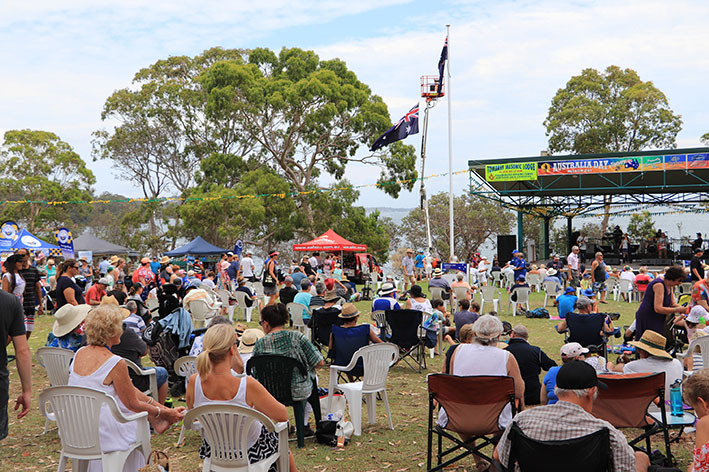 Port Stephens will be shining bright with community pride on Saturday 26 January when locals turn out to celebrate Australia Day with a packed program of free, family-friendly activities. Festivities will be held at four locations across Port Stephens —Raymond Terrace, Nelson Bay, Lemon Tree Passage and Karuah — with food, fireworks, markets, live music and lots of fun in store. Port Stephens Council is partnering with the Rotary Club of Raymond Terrace to host a family fun day at Riverside Park. Festivities will start at 8am with a free barbecue breakfast supported again this year by Raymond Terrace Bowling Club and cooked by the Rotary and Lions Clubs of Raymond Terrace. Port Stephens Mayor Ryan Palmer will preside over the official ceremony on The Mutual Stage at 9am with the presentation of the prestigious Port Stephens Annual Awards. Australia Day Ambassador Kathryn Rimmer will deliver the Australia Day address in Raymond Terrace and later at Nelson Bay. Mayor Palmer says the theme this Australia Day is ‘Everyone, every story’ — putting a strong focus on celebrating our individuality and our community. “Each and every one of us has a unique and important story to tell, whether you were born in Port Stephens, or whether you chose to make this your home. “Australia Day is a time to reflect on how lucky we to call Port Stephens home and to celebrate all of the people that make this such a fantastic place to live,” he said. “Australia Day has something for everyone — it’s the perfect way to spend a summer day out with the family. Best of all, most activities are free so it’s affordable for all to enjoy. “The celebrations in Raymond Terrace wouldn’t be possible without the Raymond Terrace Bowling Club and The Mutual, so a big thank you to them for their continued support,” he said.